When Miss Desiree Yang, 21, set up a social supermarket in September last year, she could reach out to only two suppliers and a few families. It was difficult to get more suppliers on board despite contacting more than 100 companies, she said, as they were hesitant to commit to a new social enterprise. But after she wrote to The Straits Times' Causes Week last November and had her enterprise, Saltsteps, featured, she now has about 10 suppliers who are partners, and it has helped 86 families over the past year. Saltsteps, which sells and delivers food and necessities nearing their expiry date at a discount to needy families, was one of 14 efforts featured during Causes Week last year. More than 150 people had written in to share information about their causes last year. Causes Week returns for the fourth time, from Dec 7 to 13 this year. Anyone with a story or cause to share for the betterment of society can write in for these stories to be featured in this newspaper. The hope is that more will be inspired to step up or contribute to the causes highlighted. 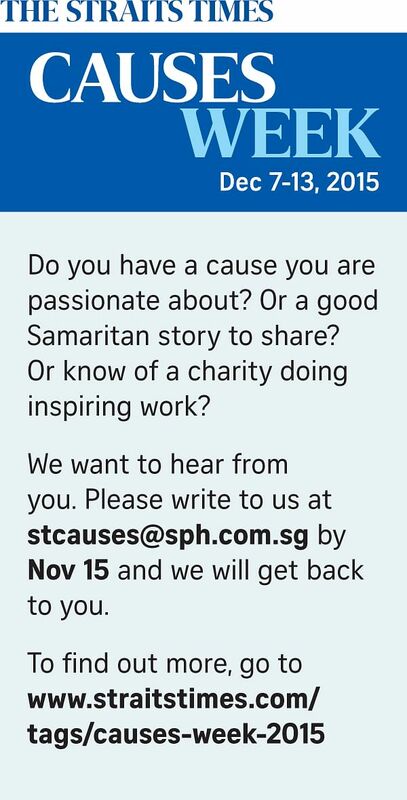 Said Straits Times deputy editor Sumiko Tan: "We want to do our part by publishing these worthy causes, which is why we are bringing back Causes Week." Being featured has helped open doors for Saltsteps, said Miss Yang, an economics undergraduate at the Singapore Management University. "It also builds credibility because we are a new enterprise and the work we are doing is new as well." It has also led to new directions. She is in discussion with one of her main partners, e-commerce website GobblerShop, to integrate Saltsteps with the company next January and form a new partnership called GobblerFive. GobblerShop organises pop-up stores, where it sells groceries at discounted prices. Its director Janan Kwek said that when Miss Yang approached thecompany, there was a "natural synergy" in what they were both doing, which led to their discussing the possibility of a partnership. Miss Yang is excited about the upcoming partnership, which she says will help her fulfil the mission of Saltsteps. "Now, I don't have to work and manage everything on my own, which is great because one person can only do so much," said Miss Yang. "With different people focusing on specific areas, it allows me to focus on continually expanding the social sector area, to have a more holistic approach. So, we don't just do groceries, but find other solutions to help needy families."